CMT (Comprehensive Monitoring Tool) is a tool meant to ensure that your IT operations keep running smoothly and without hitches. It’s a monitoring tool that allows you to monitor the entire production environment and infrastructure very closely and generates notifications as soon as any issues are identified either with the infrastructure, the models that are running or the data itself. What differentiates this tool from the run-of-the-mill tools is how it embeds machine learning thus being able to predict a failure even before it occurs. Modelers need to over-ride a number of modelling inputs on an ongoing basis as a part of their day-to-day work. To be able to modify the modelling parameters to see the potential impact on other parameters as well as on the final outcome is crucial to make the right modifications. MO (Modelling Over-rider) allows you to make such manual over-rides with a visibility on how they impact other parameters and the outcome itself. 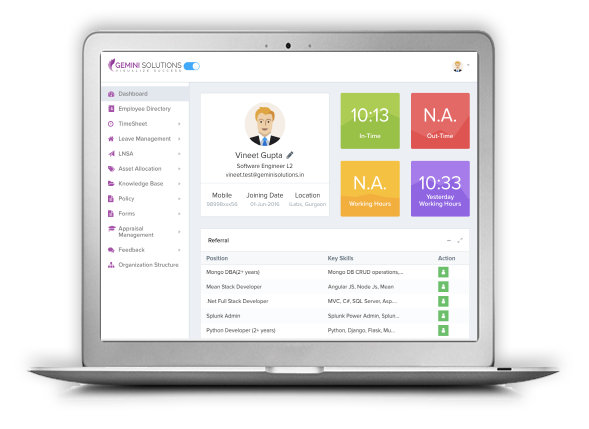 Our MIS solution is being used across multiple companies including ours and is a very effective way to organize and present all organizational information to your employees. Our video conferencing tool has proved to be a powerful collaborative solution for many of our clients coming from various industries. Along with this, it has also powered several of our own initiatives wherein online video conferencing becomes a crucial component e.g. providing education, Yoga training etc.